Analysis: Will iPhone games lead to more on the Mac? Independent Mac software developers Freeverse Software, Aspyr Media and Pangea Software are focusing on what many companies attending this week’s Worldwide Developers Conference have in their sights—staking a homesteading claim in the burgeoning iPhone application market. Apple’s iPhone 2.0 software update is due in early July, and Freeverse is using the intervening weeks to put some final spit and polish on Wingnuts Moto Racer—fine-tuning controls and making other adjustments to gameplay. Pangea’s Brian Greenstone, a Mac programmer whose roots go back decades with the platform to the first generation of sprite-based color shooters, such as a Centipede variant called Firefall, is taking a different approach with his first round of games. 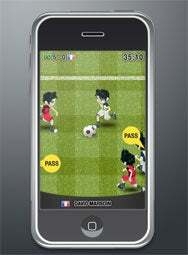 Mock-ups from Freeverse Software give an indication of what its future Flick Sports games might look like on the iPhone. Greenstone was on stage during the WWDC keynote to show off iPhone implementations of two of Pangea’s classic games. Cro-Mag Rally, a stone-age cart racing game complete with paleolithic weapons, and Enigmo, a kinetic puzzle game with liquid physics. Indeed, several of Pangea’s games were bundled on Apple hardware, including its classic 3-D action adventure game Bugdom. Could a version of that be up Pangea’s sleeve next? Another Mac industry veteran, Glenda Adams, directs a development team at famed Mac game publisher Aspyr Media. While she doubts that the Mac game market will expand beyond efforts like the company’s upcoming release of Call of Duty 4, she wonders if iPhone software development may ultimately breed the next new category of Mac games. “Writing code for the iPhone is writing code for the Mac, essentially,” Adams said. In fact, it’s so similar that it’s stimulated Adams’ interest in writing original code for the first time in several years. Adams sees growth potential in the low end of the market, too. Adams points to the cell phone and iPod game market, which prices games at $7.99 or less ($4.99 from the iTunes Store). Ultimately, the gameplay of Freeverse’s Wingnuts Moto Racer and Pangea’s Cro Mag Rally are an apt metaphor for the business of iPhone software development right now. With iPhone software sales ready to take off like a flame-blazing motorcycle across the desert—or a jackrabbiting cave-kart caroming around prehistoric lava pits—there’s little else to do but strap in and enjoy the ride.